Every visit I do to my hometown, I always make it a point to drop by Lolo's abode just to be entertained with his sharing of the funny anecdotes of his life. He never fails to charm me with unending tales from how he managed to mesmerize grandma's elusive heart to how he convinced everyone that his 10 years older of grandma was never an impediment to a happily-ever-after romance. He regularly tells me how he exercised by playing tennis till he was 70 and helping till his rice fields even up to now. I love my Lolo so much. Not because he has a high regard for what I do. Not because he loves reading my articles to the last word. Neither because he is awesomely unique with his eyeglasses. Not also because he likes talking to me in English language and that he always insists I inherited his talents and skills. I love him simply for the reason that he brings joy to the family, a true treasure himself with a comforting aura only himself can offer. When I'd see him again soon, he'd probably smile at me, maybe hug me tight and then tell me again and again how good I have turned out to be and how so good-looking I have developed into over the years. 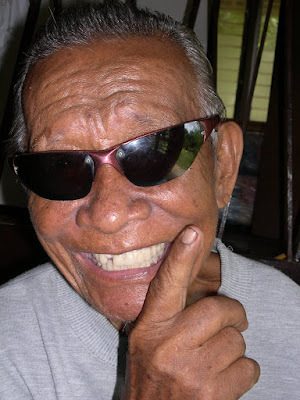 As always, I would only laugh silently and entertain the one logical yet amusing idea why I rather hope for Lolo to wear his treasured sunglasses often.